Matt Grove was drawn to horticulture at a young age. Member profile: The Local Gardener, Erin, Ont. 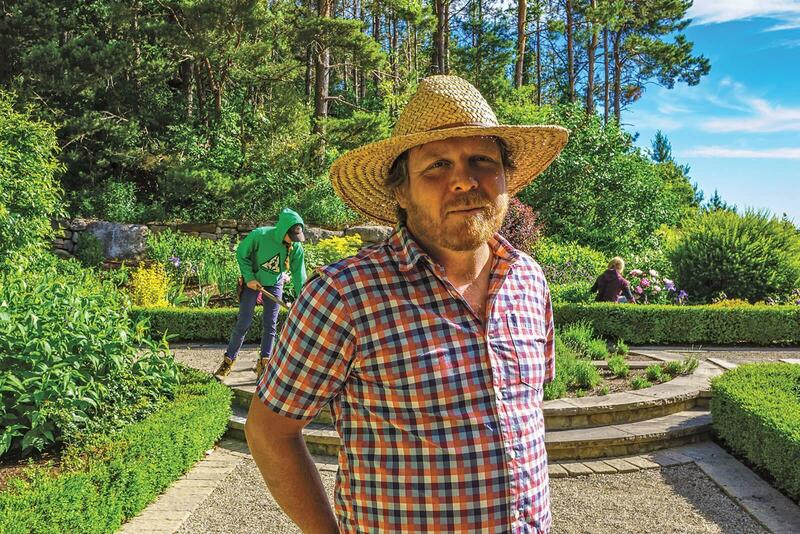 At the age of 13, Matt Gove unwittingly entered the world of horticulture when he began doing small weeding and lawn cutting jobs for family, friends, and neighbours. Matt will tell you however, that as a teenage boy with a very creative mind, music was seen as a potential career. And yet, something always drew him back to landscaping. “I worked several years for different landscaping companies, developing plant knowledge, gardening skills, and a personal leadership style, as a gardener and crew leader. While working for others, I realized I had a lot of creative vision for the kind of gardens I wanted to build and work on: large, modern, natural landscapes tended to with organic methods. As a small business owner, I also appreciate putting together a crew that shares my values for good gardening, hard work and style.” So with an entrepreneurial heart, and a passion for gardening, Matt launched his business in 2010. Since then, he has never looked back. Matt explains, “When I first launched the business, right after my second son was born, I was primarily doing maintenance work, cleaning gardens up at the beginning of the season, and then closing them down at the season’s end. Then I realized there was a niche market for gardening and maintaining large estate projects. I had some experience working up in Muskoka for some high-profile clients, and realized that was where I had a vast amount of opportunity.” Matt channeled that experience and applied it to his own business, now servicing a high-end clientele base. His projects are long-term, the gardens are extensive, and Matt himself is able to make an impact on the people he works for. Attracting passionate staff members to his niche business enables Matt to create estate-scale landscapes for high-end customers. This is where Matt sees himself as different from the traditional landscaper. “Landscapers tend to work on a transaction-based business model, whereas I prefer the small, niche clientele market, with a long-term blueprint for my business strategy.” Matt has certainly well figured the core aspects of his business, as is evident in his marketing plan… he doesn’t have one, because he doesn’t need one. Regarding staffing, Matt keeps it simple. “There’s not really a formal process I take when it comes to hiring. As a matter of fact, most of the time my staff seeks me out, which right there tells me they have some kind of interest in not only working, but in gardening as well.” Matt’s also quick to convey that to be successful, he needs to have staff that are just as passionate about gardening as he is, and passionate about the finished product delivered to the client. “Beyond that” Matt says, “keep your staff happy. Have a great working relationship with them, respect them, teach them, and the rest will come naturally.” I confirmed that Matt walks this talk, as I met with his staff while conducting this interview, and they absolutely love their jobs, and their boss. This type of staffing model is a win/win for The Local Gardener. One other element Matt feels is essential to his business strategy, is his membership with Landscape Ontario. “The knowledge share that comes with being a member of Landscape Ontario has been instrumental in growing my own knowledge base, both horticulturally, as well as from a business perspective,” says Matt. “When you have a small boutique business, you can become isolated. When I attend the Landscape Ontario events and meetings, there’s always something to learn. I appreciate learning other business strategies, hearing about the staffing issues of others, talking about climate change, trends in gardening, and actually having a conversation with others in my profession — people who share some of the same struggles, as well as the triumphs.” The other no brainer for Matt is that Landscape Ontario holds most of their networking events throughout the winter months, when most landscapers are going through a slower work period. Another membership benefit that Matt is excited about is the Horticultural Technician Apprenticeship Program (HTAP) offered through the Ontario College of Trades (OCOT). Landscape Ontario provides support to both business owners and their apprentices who are interested in taking advantage of the many benefits the program has to offer.